With so many companies outsourcing a considerable share of their work, the demand for reliable stay at home workers is showing a positive growing tendency. Copywriting and transcription jobs form the bulk of available job opportunities of the web. Today we would like to review one of such opportunities, to be exact a company named SpeakWrite. SpeakWrite is a company dealing with various types of digital dictation services and they are always looking for new skilled workers to fulfill the needs of their multiple customers. Right now there are available positions for typists, workers, who can complete tasks from their own homes, don’t waste time on commute and provide quality work. The main objective of this position is to be able to reproduce audio or video content in the form of a text document. SpeakWrite offers both legal and general transcription opportunities but you have to meet certain qualifications in order to become a part of their team. First of all, you need to visit their official website here: http://www.speakwrite.com/WEB/sw/employment/typist/typist-home.aspx and read all available information about this opportunity. As for the skills required, workers residing in US or Canada with at least two years of experience in the field are eligible for this position. Payments range between $10 and $15 per hour but a lot depends on the task you take up. If you are new to transcription but would like to grow in this field, you can try other similar companies, which are hiring workers with no experience, good examples include: TranscribeMe.com and Scribendi.com. So far we have read only positive reviews about SpeakWrite. 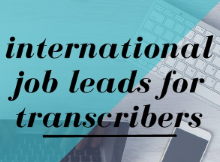 Company managers are good at providing assistance to their workers and people seem to be enjoying earning extra money by doing such transcription work.